This weekend is it. If I can’t get my 1948 Willys CJ-2A up and running by Sunday night, all hope is lost. The problem is, I just found out that my engine bearings are toast. All of them. That’s quite a lot of play, and after removing the bearing caps and seeing that the crank looked decent, it became clear to me that the bearings themselves were worn down. 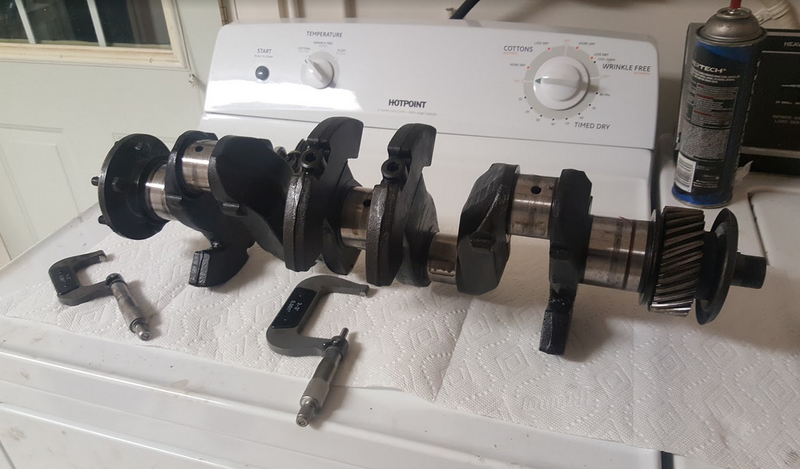 To make doubly sure, I broke out the plasti-gauge (just a little piece of plastic that you squeeze between the bearing and journal), and measured a clearance of about 0.006 inches across all four rod bearings. The spec is 0.001-0.0019. Gulp. So that’s when I went ahead and “mic’d the crank,” breaking out my trusty micrometer to see whether the crank had been machined at some point, or if the journals were the same size as they were from the factory (1.9385 - 1.9375). I measured 1.928, meaning the crank has been machined, and I need to get “0.01 under” rod bearings. The main bearings, too, were toast, with a clearance also measuring about 0.006 inches compared to the spec of about 0.003. After mic’ing it, I found that the main journals were 0.020 under. Long story short, I’ve decided to buy a new set of “ten under” rod bearings and “20 over” main bearings. And, since I’m doing that, I figured I’d buy new piston rings as well. God, I think I’m in too deep. So this weekend is going to be a long one. But if I can’t get those cylinders honed, those new piston rings in, main and rod bearings in place, and all of it buttoned back up and thrown into the Jeep by Sunday night, getting #projectslowdevil to Moab on time will be impossible. No pressure. If you want to know how this build is going, follow along on my Twitter and Instagram. It’s crunch-time. I Can't Stop! I Must Save The Willys!